If it seems like the perfect, ideal posture, where the upper back is straight and not rounded, and the lower back has a gentle sweeping curve that neither slouches nor over arches, is more the exception than the rule, you may not be too far off from the truth. Most people don't know that getting good posture takes work. Without making daily efforts towards an ideal posture, you may over time find that moving around without pain requires even more work than would a preventative program. Ideal posture is really about body alignment; in other words, the way your structural parts such as head, trunk, hips, knees, etc., relate to your form as a whole. Whether you're standing, sitting, lying down or moving, the body parts need to be balanced in order for ideal posture to take place. When you're sitting or standing still, posture is considered to be static, and when you're moving, it's considered dynamic. Both static and dynamic postures are categorized as active postures. If you're lying down and doing nothing, this is known as inactive posture. 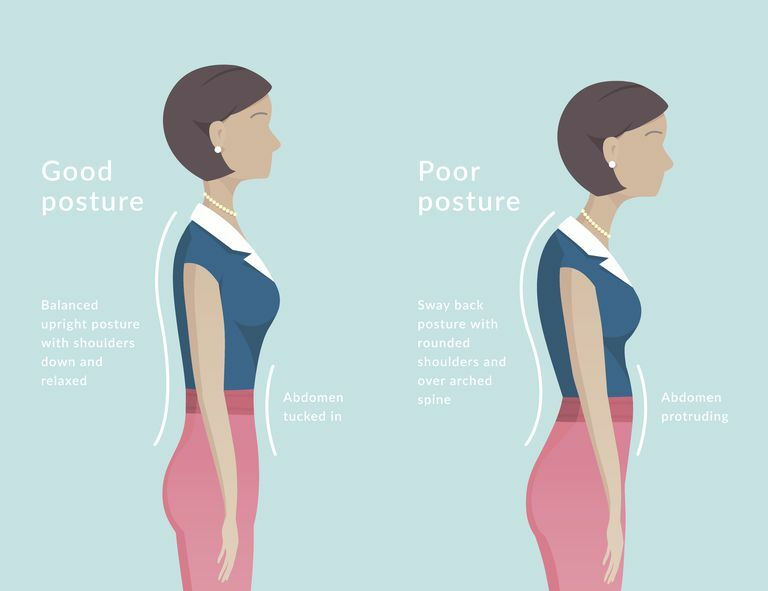 Any of the above types of posture may be ideal or non-ideal. This where body alignment comes in. You're probably pretty close to ideal posture when you can get your head, shoulders, spine, hips, knees, and ankles to all line up well with one another. Also called proper alignment, this state of body balance underlies everything from a good workstation and industrial ergonomics to successful back surgery. In general, though, establishing and maintaining good body alignment may be one way you can reduce, or even eliminate, undue stress on your spine. Ideal or proper body alignment is key for good posture. Ideal alignment is a standard and (mostly theoretical) position in which all joints of the body are centered and balanced. Ideal alignment is the most mechanically efficient position for any given activity, whether static or dynamic. Why is this important? Because mechanical efficiency enables the muscles that surround your joints to work in balance, which in turn, may help reduce strain, tension, and injury. Balanced muscles conserve energy, too. Instead, most of us are "creatures of habit" meaning over time, we've developed certain habits in our joint positioning that may lead to imbalanced muscles. When this is the case, some muscles become chronically stretched while others become chronically tight — all in an effort to hold you up or move you around. Imbalanced muscles often lead to pain or movement limitation. Have You Had a Posture Assessment? According to physical therapists Kendall and Kendall, in their landmark reference book, Muscles: Testing and Function (with Posture and Pain,) the best way to determine if one's posture is ideal or less than ideal is by looking at joint positions and gathering visual information about the planes into which parts of each joint move, as well as the axes around which those movements occur. This is called a posture assessment. In a posture assessment, your body alignment is compared with the ideal standard, which is in the form of a plumb line. The plumb line is usually a string with a small weight attached to the bottom to help keep it straight. The other end of the string is affixed to the ceiling so that it can be used as an accurate reference for ideal alignment. During a posture assessment, you stand next to the plumb line while your evaluator compares the relative positions of the following parts to it. If any of the parts don't line up with the reference, this may signify misalignments in one or more areas. The good news is that body misalignments such as these can quite often be addressed by stretching, strengthening, and developing core strength, along with developing good sitting, standing and resting posture habits. That said, it's important to work with a qualified, licensed physical therapist in order to use exercise to achieve ideal posture. Proper Body Alignment. National Osteoporosis Foundation website.